1. New tariff talk: President Donald Trump is preparing for a new global trade battle over cars. Commerce Secretary Wilbur Ross said Wednesday that following a conversation with Trump, he is launching an investigation into whether automobile imports are hurting US national security. The imposition of any new car tariffs would be painful for foreign automakers and their US customers. The biggest exporters of new passenger vehicles and light trucks to the United States last year were Mexico, Canada, Japan, Germany and South Korea, according to US government figures. Carmaker shares were under pressure with Volkswagen (VLKAY) and Nissan (NSANY) falling by 1% or more. Shares in Toyota (TM) were down by 3% in Japan. 2. Deutsche Bank job cuts: Germany's biggest bank is slashing more than 7,000 jobs. Deutsche Bank (DB) announced plans to overhaul parts of its investment banking business and bring down costs. It's the latest effort by Deutsche Bank to turn around its business after years of losses. Last month, it ousted British CEO John Cryan, replacing him with Christian Sewing, who has spent his entire career at the bank. 3. Stock market movers -- L Brands, Rusal, Samsonite: Shares in L Brands (LB) -- the parent company of Victoria's Secret -- were dropping by about 5% in extended trading after the company released lackluster quarterly earnings. The company's stock hit a peak in mid-2015 above $100 per share, but is now trading around $30. Shares in the struggling Russian aluminum giant Rusal spiked by about 7% in Hong Kong trading after the company's CEO and seven directors resigned. The exodus comes as the company tries to escape new US sanctions that threaten its future. Rusal is part of a tangled web of corporate entities controlled by the sanctioned Russian oligarch, Oleg Deripaska. The US Treasury Department said last month it would consider easing sanctions on Rusal if Deripaska divests. Shares in luggage-maker Samonsite (SMSOF) plunged by 10% in Hong Kong before they were suspended "pending the release of an announcement in respect of further clarification on a report containing allegations against the company," the company said in a statement. Texas-based activist investor Blue Orca Capital earlier accused Samsonite of "questionable accounting practices." 4. 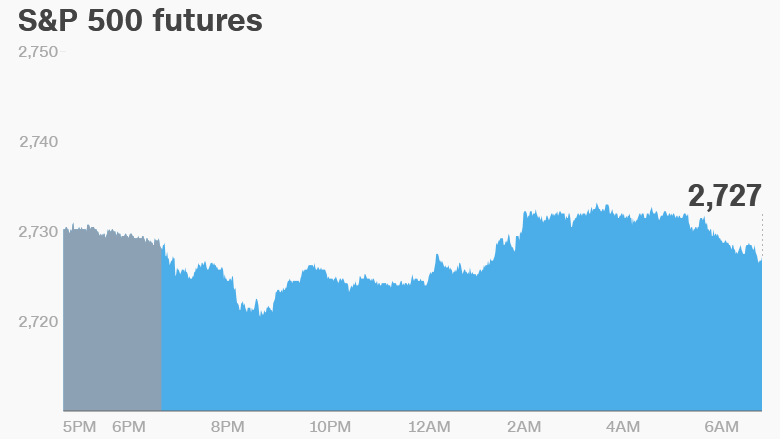 Global market overview: US stock futures were holding steady on Thursday. European markets were making modest gains in early trading. Asian markets ended the day with mixed results. Turkey's benchmark stock market index was among the main gainers of the day, up about 1.5% after the central bank hiked interest rates on Wednesday to try to halt a collapse in the value of the currency. The lira rebounded slightly after the rate hike but then fell again and is currently trading near its record low against the US dollar. US markets made modest gains on Wednesday. The Dow Jones industrial average edged up 0.2%, while the S&P 500 rose 0.3% and the Nasdaq jumped 0.6%. 5. Earnings: Best Buy (BBY) and Hormel Foods (HRL) are releasing earnings before the open Thursdsay, while Gap (GPS) plans to report quarterly results after the close. 6. The privacy scramble: A sweeping new European data protection law that gives consumers much more control over how their personal details are used takes effect at 6.01 p.m. ET. Regulators say the rules are necessary to protect consumers in an era of huge cyberattacks and data leaks. The EU General Data Protection Regulation (GDPR) applies to any organization that holds or uses data on people inside the European Union. Companies are engaged in a last-minute scramble to ensure they are compliant with the rules. Many are sending out emails to warn customers about the changes.